I participated in an Influencer Activation on behalf of Influence Central for LANEIGE. I received product samples to facilitate my review as well as a promotional item to thank me for my participation. I'm always on the hunt for the latest and greatest skincare product that delivers results and especially doesn't cause break outs. I've tried so many products and devices that I can't recall all of them. I do know one thing, since I keep moving forward, I hadn't found one that I will stick to for the long term like my CK perfume. 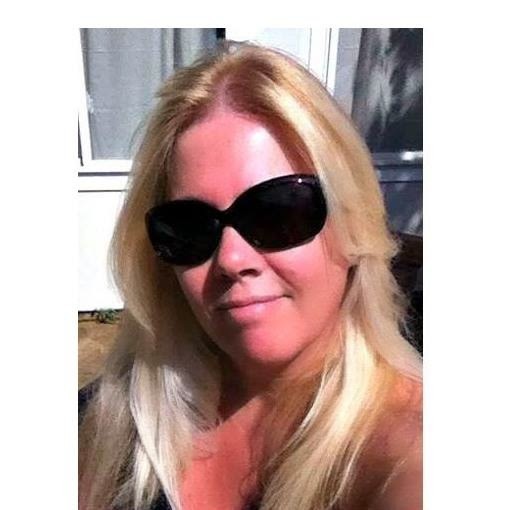 Now, I have found a new product that delivers fast results and I love it along with my oldest daughter who is 26. The LANEIGE skincare line is available exclusively at Target stores and Target.com which I also love because I shop at Target all the time so this is perfect when I pick up my children's prescriptions as they are located right next to the pharmacy. The LANEIGE skincare line features many products that will help you to streamline your routine while returning the hydration that skin desperately needs. With working out in the yard under the hot sun, my skin needs this! 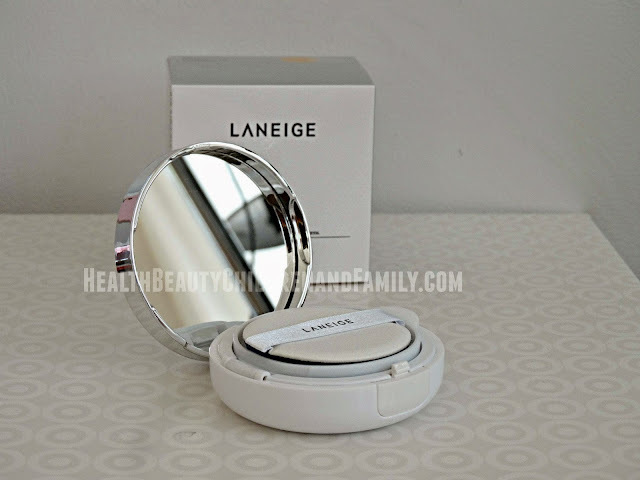 What is nice about the LANEIGE skincare line is that whatever your skin concern might be such as holding off wrinkles, hydration, brightening, wanting that youthful glow or protecting it against the environment, there is a product. Given I'm 46 and my oldest is 26, it really shows the spectrum on how it can deliver to different needs and ages. The patented Advanced Water Science™ Technology is the key with LANEIGE. I've even recommended it to friends since trying it. It's easy to use and perfect for the mom on the go to prevent the dreaded aging effects that many of us feel. Best part, it's affordable! 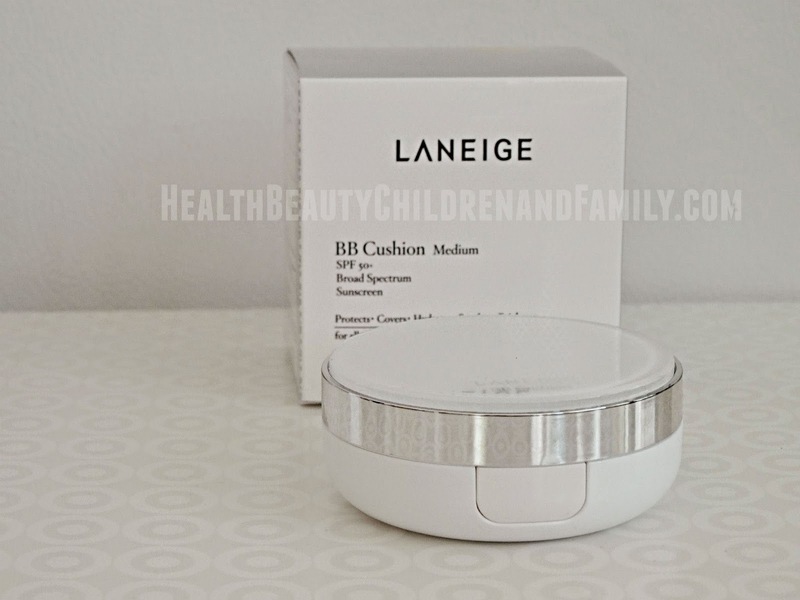 Just yesterday, I had to head out for a day full of activities so I just grabbed my LANEIGE BB Cushion compact as it's my go to foundation, sun block and primer all in one! It really does help to block shine and lasts for hours. The compact is very sleek and stylish and easy to use. It's also different from what I'm used to as I had to dab the cushion into the BB cream that is water based and it goes on smooth without looking caked on and it has no odor like the other products. My beauty routine starts once a week with the Water Sleeping masks that leaves my skin feeling recharged overnight and I do wake up with more radiant skin. I remember seeing this youthful glow back in my 30's so it's nice to see it can be achieved again. Have I mentioned that the products are dermatologist tested? My next step is the Water Bank Moisture Cream that has been clinically proven to strengthen my skin's ability to retain moisture for a 24-hour intense treatment and protection against the sun's harmful rays as well as pollution and stress. The Water Bank Serum also delivers an intense 24-hour intense hydration treatment while also protecting against the sun, pollution and stress. 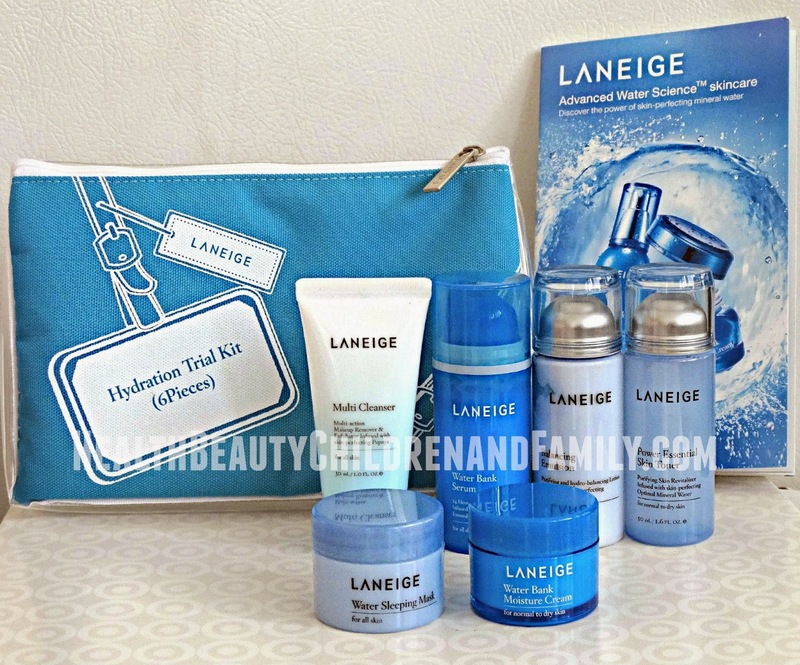 If you travel a lot, you will also love the Hydration Trial Kit that features six of the LANEIGE products to help with deep cleaning to revitalization with an exclusive skin-perfecting mineral water. The pack includes Multi Cleanser, Power Essential Toner, Balancing Emulsion, Water Bank Serum, Water Bank Moisture Cream, and Water Sleeping Mask. It's an absolute must have if you travel and perfect for the summer vacations. 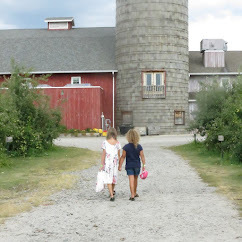 Since my daughter and I are spending a lot of time outdoors, we love how LANEIGE is working for us! Our skin is protected when we want it to be and has such a wonderful radiant glow! Don't forget that Mother's Day is coming up and this would make a perfect gift and if you purchase LANEIGE Water Bank Moisture Cream, Water Bank Serum or the BB Custion at participating Targets between April 19 and May 2, you will receive a $5 gift card AND if you purchase $35 or more of any LANEIGE product, you will get a free LANEIGE Hydration Trial Kit! 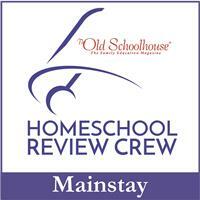 Hurry as you only have until the end of day on May 2! Visit LANEIGE at the LANEIGE website or LANEIGE at Target. 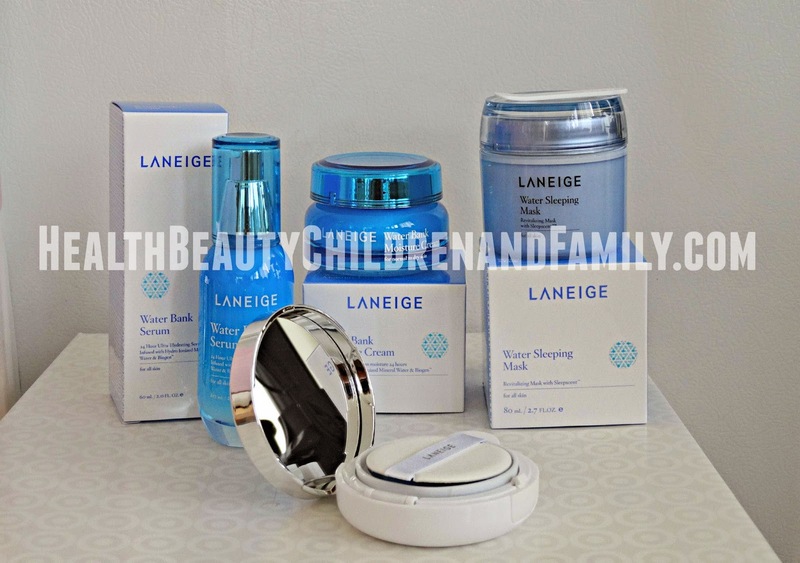 One person will win a LANEIGE Hydration Trial Kit! I learned that this line is new and offered exclusively at Target. I like the LANEIGE BB Cushion compact because it contains foundation, sun block and primer all in one! How cool!